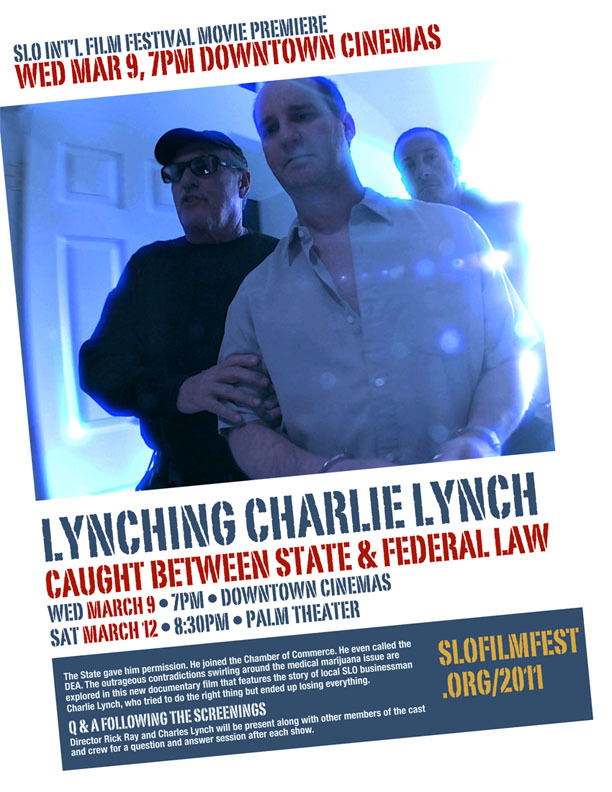 Charlie Lynch tried to help the people in his community who suffered chronic and terminal illnesses. The people of his state approved medical marijuana, but the Feds put him in jail anyway. That was 2007. He was on house arrest, trapped like an animal in a cage the size of his home. It’s been four years, and he’s still waiting on an appeal to the 9th Circuit court. The gears of injustice grind slowly, chewing up Charlie Lynch day by day. The State gave him permission. He joined the Chamber of Commerce. He even called the DEA. The outrageous contradictions swirling around the medical marijuana issue are explored in this new documentary film that features the story of local San Luis Obispo businessman Charlie Lynch, who tried to do the right thing but ended up losing everything. Back in the bad old days of law school, I talked with Charlie a few times for a paper I was trying (and failing spectacularly) to write about federalism. He was a kind and gentle man, and what was happening to him broke my heart. It still does today. Reason and Reason.tv both have backlogs of excellent coverage of Charlie’s troubles. This entry was posted in Government, Health Care, Law and tagged California, Charlie Lynch, federalism, injustice, Medical Marijuana. Bookmark the permalink. So did the DEA file charges on the state? Any reasonable person can see that the State and county aided and abetted as well as conspired and profited in this illegal venture with Mr. Lynch, if indeed this was an illegal act. A reasonable person would assume that being it was declaired to be legal in California, and Mr. Lynch fulfilled all of the requirements of state and local laws and payed for all required liscensing and permits, that state and local government should protect Mr. Lynch’s right to do buisness here. As for the Sheriffs Dept. joining up with the federal DEA gang and violating state law and Mr. Lynch’s legal rights and personal freedom, that is just plain wrong. It would have been reasonable for the Sheriffs and local law enforcement as well as state law makers to stand strongly and tell the DEA THUGS, stop right here. you will not take action against anyone in this state who is a law abiding citizen and has been conducting business as per required by law in this state and in this county…. This issue should have been decided amungst federal and state lawmakers one way or another before any actions were taken against any private citizen who was acting in accordance to the law of the land where he resides. The base root of all law is The Reasonable Man Theory, too bad people who we have chosen and pay well to uphold the law do not always act reasonably and often ruin the lives of good people, most of the time with no liability on their part. Hope the powers that be will step up to the plate and set things right for Mr. Lynch immediately if not sooner. there is no excuse for this to carry on, not one minute longer.